To a human, hiding illness seems counterproductive. If we’re sick, we go to a professional to get help. To animals, showing illness is the same as showing weakness. A change in habits is the most common indicator on a cat being ill. Warning signs include: changes in sleeping patterns or grooming habits, changes in the cat’s voice and smell, foul breath, and changes in litter box usage. Many cats are surrendered to shelters every year for doing their business outside the box, when they really needed to see a vet. When you see someone every day, it’s hard to notice changes in weight. If you can’t weigh your cat every now and then, take photos and compare on a monthly basis. Weight gain or weight loss can be warning signs. Also notice how your cat eats. If they have always been neat and suddenly start making a mess, there might be a dental problem. If your cat has enjoyed playing with other pets and starts avoiding them – or has been a loner and starts seeking attention – something might be wrong. If your cat slows down suddenly from being energetic – or drastically increases activity – it’s a good idea to visit the vet. Sudden increases in activity in older cats can be a result of a thyroid problem. 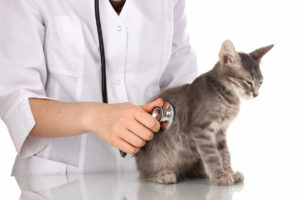 Your cat needs to see a vet at least once a year to get vaccines. Veterinarians are trained at spotting hidden illnesses, so tell your vet about any problems or changes. If your cat has a health issue or is getting older, it’s a good idea to schedule check-ups more often than on an annual basis.